First came the Apollo era. Following Sputnik and Yuri Gagarin, the first satellite and human in space, the United States leaped into the space race. Within 11 years of NASA’s formation, and with incredible public support, they managed to launch Neil Armstrong and Buzz Aldrin to the surface of the moon. The moon! Then came the space shuttle era, also a time of lofty and grand missions. NASA astronauts flew the shuttles on 135 missions, to deploy space probes like the Hubble Space Telescope and to assemble the International Space Station. But all good things must come to an end, as they say. 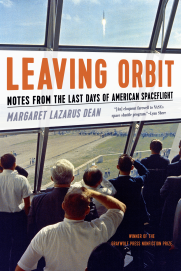 Margaret Lazarus Dean, in her new book, Leaving Orbit: Notes from the Last Days of American Spaceflight, witnesses and chronicles the final flights of the Discovery, Endeavour and Atlantis shuttles in 2011. For each of those three shuttles, she describes the visceral experience of watching the launches and landings, including the responses of diverse fellow onlookers at Cape Canaveral on the coast of Florida. 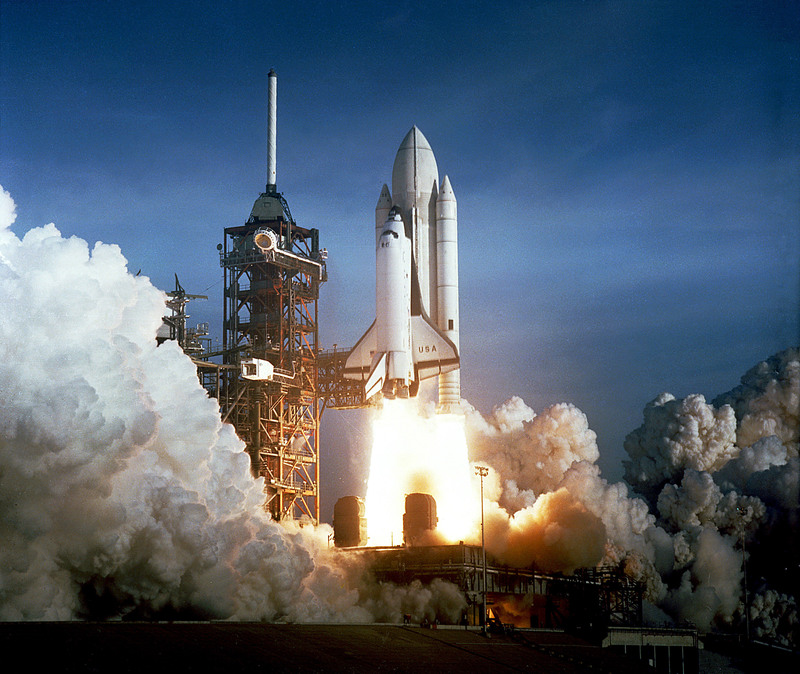 Dean reflects on the space shuttle program’s many impressive achievements, as well as its shortcomings and failures, in the case of the tragic explosion of Challenger in 1986 and the breakup of Columbia in 2003. (She previously wrote a novel about the Challenger disaster.) Throughout the book, she provides a record of a wide range of people grappling with the end of the era and wondering about what might come next. She encounters both aspiring and accomplished astronauts—she’s starstruck as she meets Aldrin (and I don’t blame her). Dean also talks to space workers, as well as other writers and journalists, who are all somehow trying to figure how to put these momentous events into words. She makes many references to iconic writers, during what she considers the pinnacle of American spaceflight. Especially Norman Mailer (author of Of a Fire on the Moon), Tom Wolfe (The Right Stuff) and Oriana Fallaci (If the Sun Dies) clearly influenced her. Dean sprinkles many telling and intriguing anecdotes throughout the book. At one point she quotes a conversation she overheard, in which a NASA public affairs person corrects a Reuters journalist, saying that it’s not the end of American spaceflight, but “the end of American spaceflight as we know it,” which seems to be a subtle distinction. She also points out that in spite of NASA currently accounting for a small fraction of the national budget, her university students overwhelmingly overestimated how much funding the agency actually receives. It gets about 0.4% of the national budget, but most of her students guessed it was more than one fifth! Maybe that demonstrates NASA’s ability to have a big impact and inspire the public imagination with relatively few resources. Dean’s book is more a memoir than anything else. It’s often fascinating to read, but it feels too wordy and verbose at times. She includes far too many mundane or irrelevant details, including the drive to and from Florida, the motels she stays at (one reference to Mailer is enough there), and numerous texts and social media posts. Omar Izquierdo, a NASA technician, host and new friend, makes for an interesting character, but every single interaction with him doesn’t need to be included. It’s as if she documented in detail every step she took and every thought that popped in her head and shoehorned them in. She also writes many times about her husband and child, who made sacrifices so that she could make these trips; she raises important concerns, but they would belong more in a book more directly touching on work-life balance and gender equality. She and her editors could have cut 100 pages from this book, in my opinion, strengthening its impact without losing any substance. A few times—maybe a few too many—Dean writes self-referentially about her own book. (Such a device can be effective in a comedy like The Muppet Movie, but I’m not sure how well it works here.) The point, it seems, is to pose a question to herself as much as to others involved in the shuttle program and commercial spaceflight: “I’m asking what it means that we went to space for fifty years and have decided not to go anymore,” she writes. Dean’s book seems slightly late: it was probably written in 2011 and includes few developments since then. She briefly mentions NASA’s Space Launch System and Orion—scheduled to be launched in an uncrewed mission in 2018—and she describes SpaceX and other spaceflight companies, but this feels tacked on at the end. I understand her skepticism about commercial spaceflight, and I share many of her concerns. She has three main criticisms: First, the big and daring spaceflight projects that she and many others support are, by definition, not good investments. “They are exploratory, scientific, ennobling, and expensive, with no clear end point and certainly no chance of making a profit.” Second, as long as spaceflight is run by a government agency, she says, any child can reasonably dream of flying in space one day. Third, it’s been part of NASA’s mandate to make its projects available to the public, but private companies have no such obligation. I don’t think Dean means to diss NASA, but it does seem that way toward the end, as she seems to think ending the shuttle program was a huge mistake. But what’s done is done, and without the shuttle, NASA continues to accomplish a lot. In the past year alone, it deployed a satellite to study Ceres, the only dwarf planet in the asteroid belt; it flung a probe past Pluto, giving us the most detailed images ever of our diminutive cousin; it sent a spacecraft to observe Saturn’s moon Enceladus; and it recently completed a yearlong study of the astronaut twins, Mark and Scott Kelly. Later in the book, she argues cynically (and to some extent, correctly, in my view) that support for the space program started as an accident, because of Sputnik, a new president, the Cold War, and German rocket designers like Wernher von Braun who fled to the U.S. instead of the Soviet Union. In the end, however, her reflection turns into an almost obsessive nostalgia for a glorious past. This stifles our ability to take stock of where we are right now and how we got here, and then focus our efforts to plan and prepare for what comes next, which might include returning to the moon, journeying to Mars, and exploring beyond our solar system. Dean’s patriotism limits her too: space exploration requires international collaboration; it isn’t just by or for blue-blooded Americans. It’s for all people who want to join the party, including Russians, Chinese, Europeans, and everyone else. Mourn the shuttle era in your own way, but then let’s move on with our lives and make the most of our current national and international space programs. We have lots of brilliant, clever and talented people and powerful tools to work with, and if we set our minds to it, our days of exploring space, including launching more people into the skies, will be far from over.